This Odin’s Day we’ve got something a little special. I’m currently looking into the possibility of adding on an extra pledge level that will let you bring the game up to 5 players. The game has been fully tested with 5 and we’d hoped to be able add enough dice to stretch to 5 players with stretch goals, but it doesn’t quite look like we’ll get there. The good news is this means adding an extra hero for every backer when we fund. These heroes take the game to the next level, but heroes aren’t just born, they’re made on the battlefield and we’d like your help to choose which warrior to turn into our newest hero, but you’ll need to know what they’re all about first. First up is Olaf Foeseeker. Olaf Foe-seeker made his name young. He travelled far and wide, always keen to lend his sword to a battle with a storied hero on the other side of the shield wall. While other heroes proved their worth with battle prowess – fighting five men at a time, holding a bridge single-handedly – Olaf watched and waited, saving his strength. And when the time was right, when the battle was almost done, he would pounce, raising himself up by striking other named warriors down. When the great winter came, Olaf didn’t have a great hall or a strong clan behind him but his name and his boasts drew a desperate few. If you fought with Olaf, you would not die in your hall, wasting away from hunger, you would fight and you would kill and your deeds would be remembered in story and song. Our testers have found Olaf to be one of the most heroes difficult to play, but also one of the most rewarding. 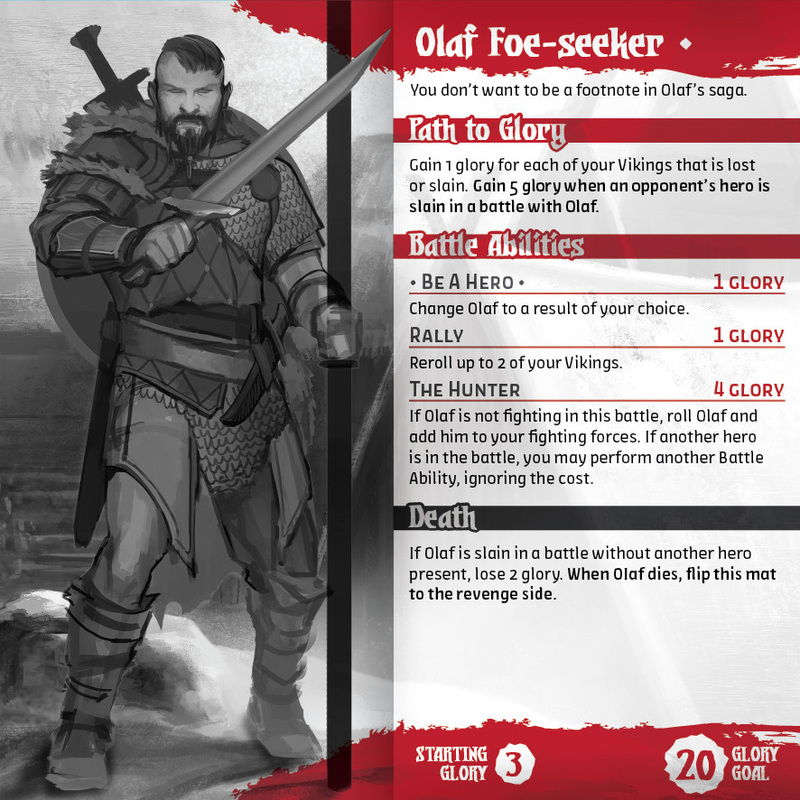 Many of the other heroes Paths to Glory provide a reliable stream of glory, but Olaf needs to bide his time, relying on Fate until he can find the perfect moment to strike. His very presence can strike fear into the hearts of other heroes and can change the dynamic of the game as other players do their best to not fall into Olaf’s traps. The Hunter ability can be used to pounce on players who have left their hero at home without enough support, but also adds a great degree of flexibility, if you can stomach the glory cost. Next, we have Brenna Battleborn! There are many tales of babes born on the battlefield. The seers say it is an omen of a great but cursed warrior. A child so born will grow into a strong warrior but is fated to die as they were born, covered in blood, screaming and surrounded by loved ones. Actually, to a Viking, that doesn’t sound half bad. Brenna isn’t afraid of death, and any player that uses her shouldn’t be either. 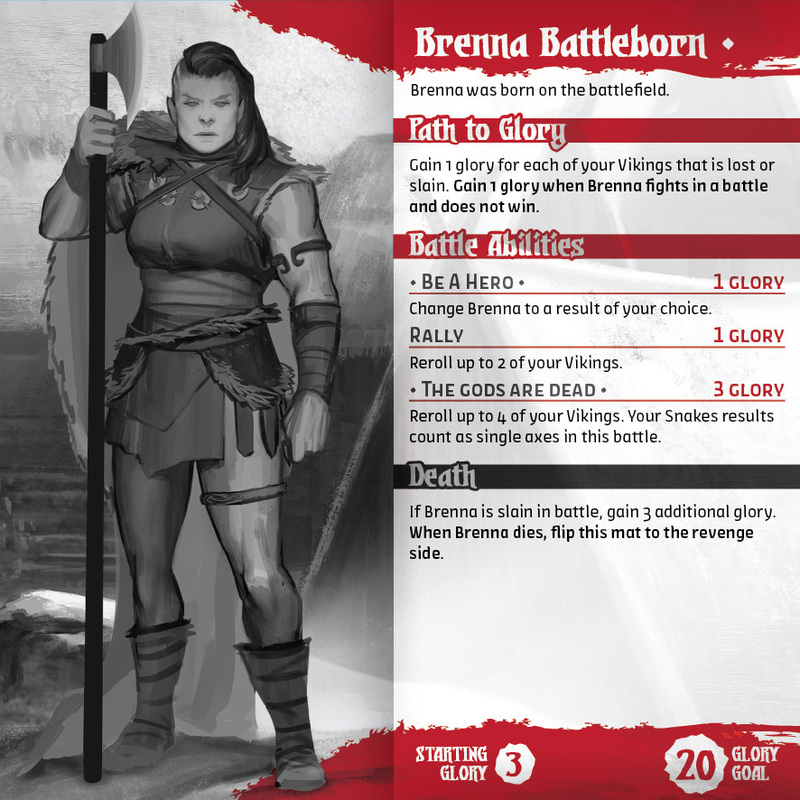 To head towards a glory victory, you’ll need to flirt with danger, pushing Brenna into battles she won’t win and might just lose, taking best advantage of the Fate cards available. Other heroes are faced with a tough decision when battling Brenna as slaying her can end up in a pretty large glory gain for her player, more than enough for her inevitable revenge. Ready to rally behind your hero? We’re giving you lots of ways to show you support for your hero, and a week to do so. We’ll be counting up all the results across all the social media. Shout out your hero’s name in the comments below!